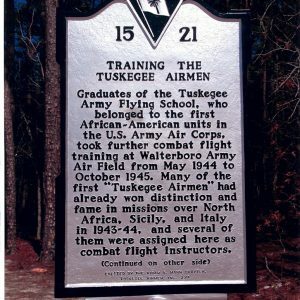 During World War II, the first African Americans in the U.S. Army Air Corps graduated from the Tuskegee Army Flying School in Alabama. From May 1944 to October 1945, some of them took further combat training here, at Walterboro Army Air Field. Several of the earliest “Tuskegee Airmen,” who had already won fame in missions in Europe and North Africa, were assigned as combat flight instructors. Trainees here flew the P-39, P-47, and P-40 fighter planes and the B-25 bomber. Officers’ quarters and enlisted men’s barracks stood just east and just west of this spot, respectively.